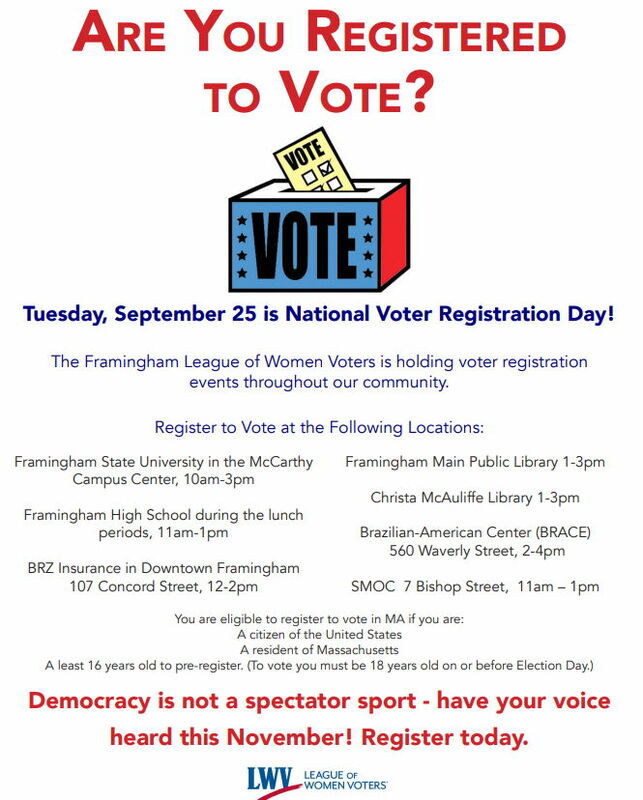 The Framingham League of Women Voters is holding a community-wide voter registration drive Tuesday, Sept. 25, as part of National Voter Registration Day. League volunteers will be in District 2 at the McAuliffe Library Tuesday from 1 to 3 pm, as well as Framingham High School during lunch periods from 11 to 1. Students can pre-register at 16 years of age, although you must be 18 in order to vote on Election Day. In addition, volunteers will be helping people register elsewhere in the city at Framingham State University’s McCarthy Campus Center from 10 am to 3 pm, BRZ Insurance downtown from noon to 2, the main library from 1 to 3, the Brazilian-American Center at 560 Waverly St. from 2 to 4, and SMOC at 7 Bishop St. from 11 to 1. Anyone who is a U.S. citizen and a resident of Massachusetts can register. Can’t make it tomorrow? You can also register online.